Few people seemed to notice when Iran President Mahmoud Ahmadinejad spoke on October 17th that “Grounds are being prepared for the Zionist regime to go to hell soon, and any other country supporting this regime will join it on its trip to hell as well.” He spoke of the day the United States would one day apologize and “beg” for relations with Iran because the Obama administration had become so “weakened” that it could not harm Iran in any way (“Ahmadinejad: Israel will soon go to hell,” World Jewish Congress, October 18, 2010). Have we become so desensitized by the Iranian dictator’s rants that the Holocaust was a “Zionist myth,” Israel will be soon “wiped off the map,” and that the U.S. is too weak to stop it? 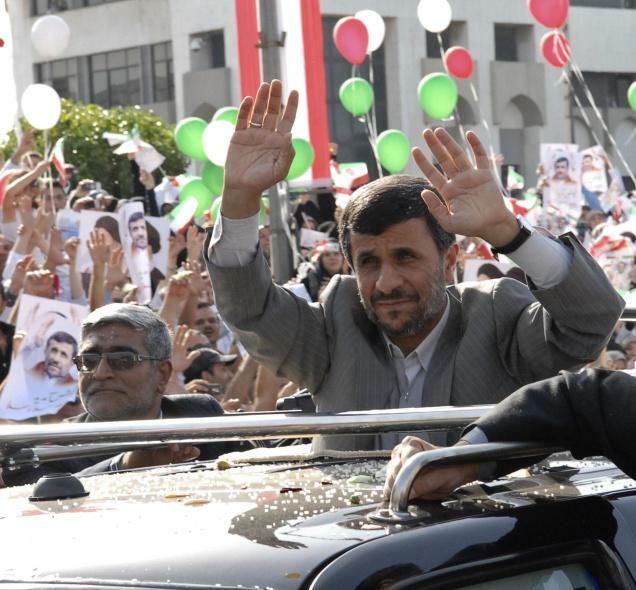 Do we care that Ahmadinejad was given a hero’s welcome in Lebanon by thousands of cheering Lebanese waving giant posters of Ahmadinejad and Hezbollah flags before his meeting with Lebanon’s President Michel Suleiman? Mahmoud might come off to us as a madman but he isn’t stupid. He is extremely popular in much of the Middle East, especially Lebanon, and is invited every year by the United Nations to say whatever he wants to the world’s “diplomats.” His Iran has the resources and power to give weapons and influence to Hamas, Hezbollah, Lebanon, Iraq, and of course, the Palestinians in Gaza and the West Bank. “Israel is a democratic and free nation of ordinary people who sometimes make mistakes,” Stephens claimed, “and we are wrong to expect more.” He said that for Israel, the expectations are high and “nothing is forgiven;” on the other hand, nothing is expected from the Palestinians or Iran and “everything is forgiven.” Is that, I wonder, why few make a fuss when the strongest leader in the Islamic world claims that Israel must be destroyed? Stephens claims the attitude in the West is that we “need to accommodate” Iran but I’m not so sure. I wonder instead whether we’re simply burned out by the wars in Afghanistan and Iraq. According to Tom Brokaw, we hardly talk about them, even in their ninth year. He writes, Afghanistan and Iraq are “the longest wars in American history,” in which 5,000 men and women have been killed, 30,000 wounded, which has cost well over “$1 trillion on combat operations and other parts of the war effort…and the end is not in sight” (“The Wars That America Forgot About,” Tom Brokaw, New York Times, October 17, 2010). Even if we tire of hearing the same old murderous anti-Semitism from Iran’s leader or worry about stopping his country from becoming a nuclear power, can we really afford another war that will cost more American and Israeli dollars and lives? The U.S. is burdened with massive deficits, two wars, thousands of foreclosures, high unemployment, politicians who can’t get along, and a deep distrust by many Americans over their own government. In this environment, does it make sense to threaten Iran with war or even, as Stephens says, the better option of a military strike, targeting Iran’s three nuclear production facilities? It’s easy to become worn out by rampaging fanaticism throughout the world, ineptitude from our elected officials, and simply get tired of getting angry. That is why so many have simply settled into a persistent state of casual complaisance, which Ahmadinejad rightly perceives as weakness. While Iran flips its finger at the United States and strengthens its associates of terror with weapons, we can sit back in acceptance, focus on making ends meet, and hope for the best. Or we can get out of our stupor and stand behind Israel, calling out the hypocrisy of world leaders and many in the press who seem to forgive Ahmadinejad’s call for genocide against Israel. We must demand that our “best and brightest” leaders do whatever it takes to stop Ahmadinejad’s Iran from its stated goal to wipe Israel off the map. How we do that without the ominous threat of war? That is the ultimate question.